Evolution is an advertising campaign launched by Unilever in 2006 as part of its Dove Campaign for Real Beauty, to promote the newly created Dove Self-Esteem Fund. The centre of the Unilever campaign is a 75-second spot produced by Ogilvy & Mather in Toronto, Canada. The piece was first displayed online on 6 October 2006, and was later broadcast as a television and cinema spot in the Netherlands and the Middle East. The ad was created from the budget left over from the earlier Daughters campaign, and was intended to be the first in a series of such online-focused spots by the company. Later pieces include Onslaught and Amy.Evolution was directed by Canadian director Yael Staav and Tim Piper, with sound design handled by the Vapor Music Group, and post-production by SoHo. 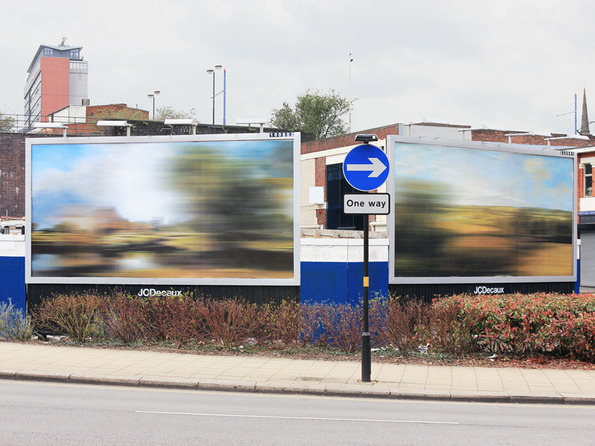 Ben Long’s blurred digital prints not only wrong-foot passing motorists but also explores the idea of images losing their potency through ubiquitous representation. “These artworks could be taken simply as a subversion of representational art because they appear to disrupt the traditional values of painting and present abstraction as high octane thrill-seeking,” Ben says.